On July 8, 1976 the house at 217 Stradbrook Avenue, Winnipeg was demolished to make way for new tennis courts at the neighbouring Winnipeg Winter Club. Until a few days before, this solidly built home, one of the few remaining in the area, was owned and occupied by Mrs. A. D. (Frances) Frankland, the youngest daughter of the original owner. 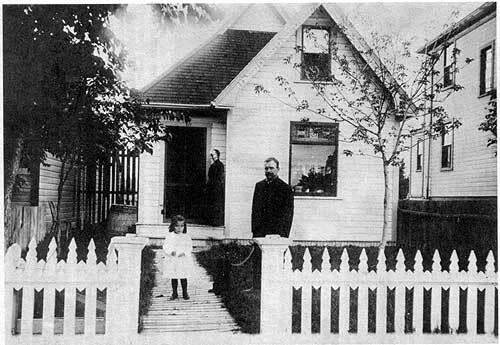 217 Spadina (circa 1902) - Mrs. Frankland as a child, with parents. Source: Mrs. A. D. Frankland. Mrs. Frankland's father, Henry Stephen Manuel, was a fine craftsman in quality upholstery with the firm of Scott and Leslie when he and his family moved into the home in 1902. The street name at the time was not Stradbrook, but Spadina. 217 Spadina appeared unpretentious on its twenty-five foot lot. Most of the other houses on the north side of Spadina were somewhat larger, occupying fifty foot lots. Mrs. Frankland recalls that the families who lived in these homes before World War I were the Spences, Johnstones, Weeks, Keiblers and Evans. The immediate residential area extended northward through where the Winnipeg Winter Club now stands. On the south side of Spadina at the site of a new apartment block (240 Stradbrook) Hargrave's and later More's Coal yard remained in operation for many years. Tragic circumstances prompted the move of the Manuel family from their previous home at 333 Gertrude Avenue in 1902. Henry Gordon, the only son, at nine years of age had just drowned when he slipped into the Red River while fishing near his home. His parents and four sisters survived him. To perpetuate his memory the family had his portrait painted in pastels by the well known Winnipeg artist Victor Long who lived in the same neighbourhood, on Wardlaw Avenue. Long is best known for painting several of Winnipeg's former mayors. He painted the boy's picture in Scottish highland costume from a recent studio photograph. The large handsome painting hung in a dominant place in the family living room from 1902 for seventy-four years until the house was made ready for demolition. The living room also held other memorable objects from the past - fine tufted upholstered chairs hand crafted by H. S. Manuel himself and two gifts presented to him by his firm when he decided to move to Victoria, B.C. in 1912 - a mantel clock and a steam-bent birchwood rocking chair bearing a picture of the old Manitoba Hotel. After a year in Victoria, the Manuel family returned to their house in Winnipeg in 1913. H. S. Manuel resided there until his death in 1929. One recollection which Mrs. Frankland associates with the house is the 1919 Asian flu epidemic. She was stricken two years after her marriage and shortly before giving birth to her eldest daughter. 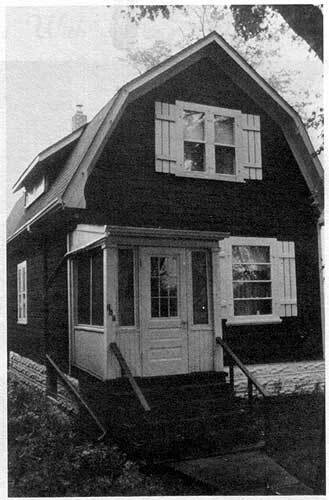 She and her husband Alfred lived in the house for several months while she and her baby were cared for by her mother, a nurse and the family doctor. After Mr. Manuel's death the Franklands returned to live in the house with Mrs. Manuel. There they raised their two daughters. After Mrs. Manuel's death in 1935 they remained. Alfred Frankland was employed by Winnipeg Electric and later Manitoba Hydro. Mrs. Frankland continued to live in the house after she became a widow in 1972 as her mother had done a generation earlier. Significant structural changes were made to the house through the years. In 1926 the roof was raised and modified to accommodate three rooms upstairs, and a beam ceiling, hardwood floors and an enclosed veranda were also added. In 1940 the Franklands made further renovations - a new basement and heating system, and a smaller front veranda to allow more light into the living room. With the exception of a few years in her early childhood and the years in the 1920s when she and her husband lived away from her parents Mrs. Frankland has always resided in this home. Now she moves to an apartment with seventy years of memories in this house - memories which may seem commonplace to the outsider - but they have a continuity that is rare in the mobile society of today.